MP Anna Soubry has criticised police for not intervening after she was verbally abused outside Parliament. The Conservative ex-minister was accused "of being a Nazi", while being interviewed on the BBC News channel. She called for the protesters to be prosecuted under public order laws. The police said they were assessing if any crimes had been committed while Commons Speaker John Bercow said he was worried about a "pattern" of women MPs and journalists being targeted. Raising the issue in the House of Commons, Labour's Mary Creagh said the "really vile, misogynistic thuggery" that had been seen was not an isolated incident. She accused far-right groups of re-playing Monday's clip and others like it on social media sites to "raise revenue for their trolling activities". 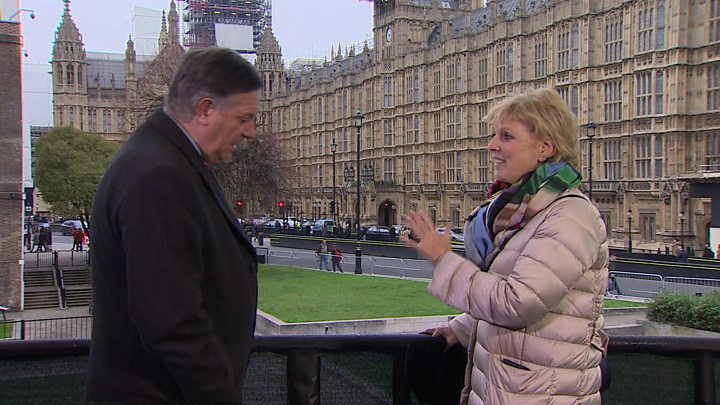 Ms Soubry, the pro-European MP for Broxtowe who supports another Brexit referendum, was subjected to verbal abuse while being interviewed by the BBC's Simon McCoy. Protesters standing just a few yards from the entrance to Parliament accused her of being a liar and then chanted: "Anna Soubry is a Nazi." She was later shouted at and jostled as she tried to re-enter the Palace of Westminster. Reacting during the live interview, she told McCoy she "objected to being called a Nazi", adding that such language was "astonishing - and this is what has happened to our country". Media captionAnna Soubry: "This is astonishing. This is what has happened to our country"
She said she would not be silenced nor intimidated but it was wrong that MPs and others doing their job in such a public space should "have to accept this as part of the democratic process". After the incident, she told BBC News the police needed to "do their job" and would contact them about the matter. The Metropolitan Police said they were investigating reports of a public order offence but no arrests had been made. The MP has already been in touch with the parliamentary authorities responsible for security. A number of MPs raised the matter with Mr Bercow at the end of a statement on the government's Brexit policy. Labour's Stephen Doughty called for "proper action" to be taken by the Metropolitan Police against those responsible for what he said were "potentially unlawful actions". And Conservative MP Nick Boles urged Mr Bercow to ensure everything possible was done to not only protect the right to freedom of speech but the right of MPs to move freely in and around Parliament in "total safety". Mr Bercow said he was aware of protests in recent weeks around the Palace of Westminster "involving aggressive and threatening behaviour towards members by assorted groups that have donned the yellow vests seen in France" - a reference to last year's "gilet jaune" anti-government demonstrations. While the Met had responsibility for security outside the parliamentary estate, he said, he was keeping a "close eye" on the issue amid concerns that women, in particular, were being targeted. "I share 100% the concerns expressed and it's necessary to state very publicly the difference between peaceful protest on one hand and the aggressive, intimidatory and threatening protest on the other." Ms Creagh said there was a "strong streak of misogyny" in the wave of Brexit-related abuse directed against MPs. "We in this place remember our friend Jo Cox, who was murdered by a far-right neo-Nazi," she said. "We remember that people have gone to prison for plotting to murder another Labour MP and many people have been jailed for the abuse of other colleagues." No 10 said the incident was "unacceptable" and MPs "should be free to do their jobs without any form of intimidation". A Downing Street spokesman said there were laws dealing with public order offences and cases of harassment and threatening behaviour. The BBC and other broadcasters have set up temporary studios on College Green, a traditional spot for political interviews, ahead of the big Commons vote on Theresa May's Brexit deal on 15 January. The BBC's assistant political editor Norman Smith said some MPs had expressed unease privately about being interviewed there given the frequency and vehemence of the protests.